Is there a warning on the package stating “May contain traces of nuts and Elbonians”? He’s stuck in a right corner. It’ll drive the Fusillians round the twist. I don’t know what the odd one is called, but we just opened a whole packet of it and we don’t like it. Back to the fusilli. I suggest torture to find out what he’d doing there. Hot water torture for eight to ten minutes, followed by being covered by blanched vegetables and maybe a cream sauce, and summary eating. The QC guy in the factory must have dozed off for a second. That’s almost as good as when you get a free scallop(of the seafood kind) in amongst your fish and chips. Elbonian :) LMAO. Your powers of observation are astounding. 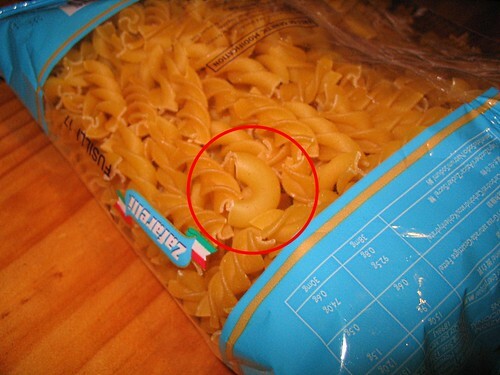 I prefer fusilli, elbows are harder to drain of all the water stuck in the c-bend.